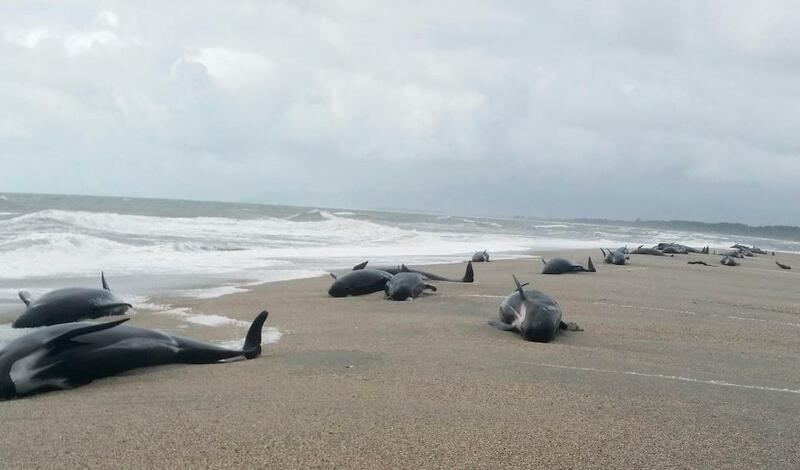 Dozens of whales washed up on a beach in New Zealand in bizarre circumstances. Pictures from the beach in Haast, in the South Westland region show 38 whales' remains strewn across the landscape. Among the total number of whales, there were 12 found alive, but they had to be euthanised by conservationists. The whales became stranded after swimming too close to the shore at the mouth of the Okuru river. While it's clear how they washed up, the reason as to why they swam so close to the shore remains a mystery. New Zealand Department of Conservation manager Wayne Costello said conditions were too dangerous to rescue those found alive. Daren Grove of Project Jonah added: 'There are various factors why this pod came close to shore - we won't know specifically. 'When they come close to shore they can get caught out by tides, currents and flee from predators like orca. Two weeks ago 150 whales beached and died while migrating off Western Australia in one of the largest mass strandings of whales in WA during a massive solar storm. Last week scientists were left baffled after 61 short-beaked dolphins were found washed ashore on a beach resort in Argentina. According to the Daily Express, the aquatic mammals were found stranded in Puerto Medryn, an Argentinian city in northern Patagonia, also during coronal activity on the Sun.